San Francisco, the area I come from, is a great place to eat breakfast. Since moving here more than five years ago, I’ve regretted the lack of good San Francisco-style breakfast places and if I had the money and free time, I’d probably open one myself. In the meantime, I’m glad to have recently learned about another candidate for my breakfast baht: Gastro 1/6. 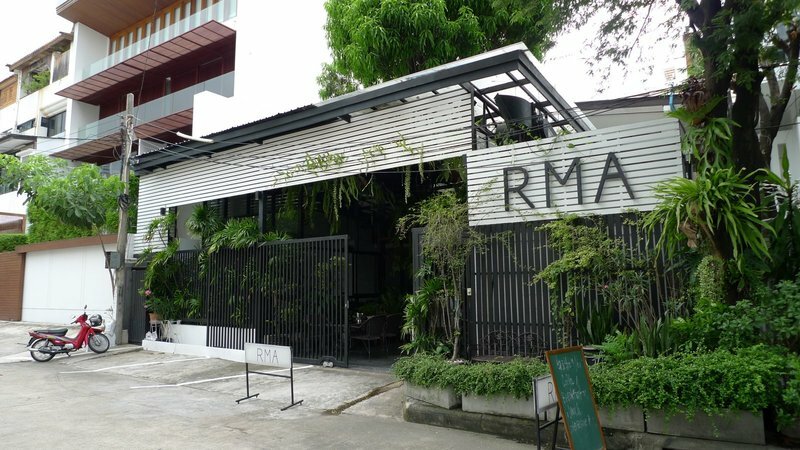 Located at the RMA Institute, a gallery and art space buried deep in Sukhumvit Soi 22, Gastro 1/6 is just a small cafe, really. It is already busy on weekends and I suspect will become so popular that its charm will quickly wear off. 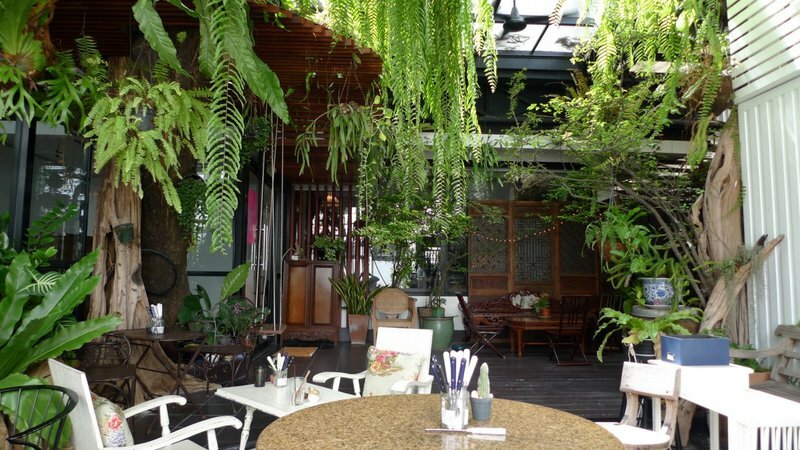 That said, it is a charming place in a way that eludes most restaurants in Bangkok. All the seating is in an outdoor, although covered, space that is thick with foliage and decorated with a motley assortment of chairs and tables. There is no table service – you order at the counter and pick up your own food. The kitchen is a tiny, open affair with a limited selection of dishes. Pastries are available from Le Blanc, a local bakery that is improving the quality of baked goods available to us denizens of Bangkok. There are both breakfasty type dishes as well as specials more suitable for a lunch, making this an appealing place for brunch and those who can’t decide what they’re in the mood for. The grounds are home to a friendly dog who greets visitors and generally manages things. We arrived at what we thought would be a bit late – about 10am – on a Sunday and were surprised to find things not very busy yet. Some other people breezed through, mostly it seemed for a quick bite and then on to whatever else was on their docket for the day. Tawn had French toast with a side of bacon, which was very tasty. There’s a drop of syrup about to drip from the bacon on the right end of it. Caught it with the camera! 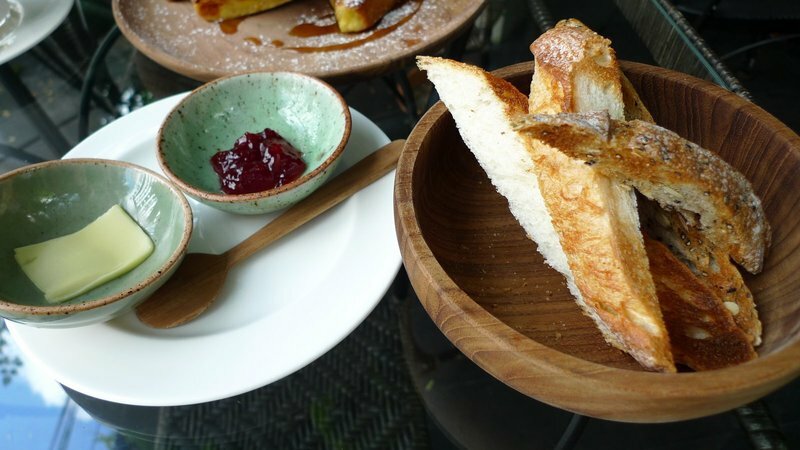 My breakfast came with a bowl of toasted bread, thin slices that definitely wouldn’t appeal to the Thai palate, which doesn’t seem to like crispy and crunchy. Perfect for me, though, who likes his bread willing to fight back a bit. I had the traditional English breakfast, which was spruced up so nicely I barely recognized it. 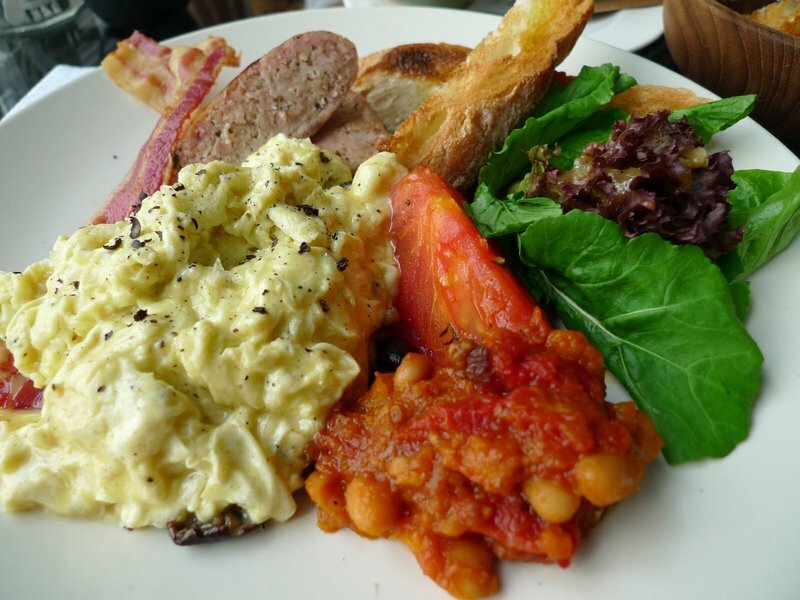 Scrambled organic eggs with fresh cracked pepper and sea salt, homemade baked beans and baked tomato, salad with a lovely dressing, homemade sausage, and some bacon. This was really tasty and just the perfect serving size. Afterwards, relaxing with my latte as an English family with three adorable children decide what they want to order. Tawn, fresh off his fashion show, looks so much more relaxed without the stress of an impending deadline looming over him. My impression? Gastro 1/6 is a cute and satisfying choice for brunch or even pastries and a cup of coffee. Probably not the place to linger for a long time, but a good start to your morning. Cash only, closed Mondays. This entry was posted in Uncategorized and tagged 22, breakfast, Brunch, Dining, food, gastro, gastro 16, institute, Krungthep, Restaurant, RMA, Soi, Sukhumvit, Thailand by christao408. Bookmark the permalink. The brunch looks so delicious and quite authentic. Just like an upscale eatery. How much was the meal? Nice b&W photos, have you considered to put those in a photo frame? the place so relaxed and love your photos! Yum! Were there a lot of pesky mosquito with all the trees inside? That’s the one thing that always bugs me (no pun intended) with indoor plants. They always attract creepy crawlers. Looks like a relaxing and beautiful place for breakfast. Mine would match yours! Looks like a nice place to eat. Looks like a perfect breakfast nook, Nice! He does look relaxed, i hope relaxed knowing he did an excelent job . MMM…. Bacon. As Homer Simpson would say. HA! What a neat little cafe — I love those little hidden garden spots! Another nice food spot! I guess the dog runs around and collect tips? I like the picture of you zipping coffee. You look very English. Hehe! Love the B&W photos! sounds like a great brunch spot, and hopefully it remains a place where you can go for a quiet, relaxing breakfast outdoors! i like your “traditional” english breakfast, also; the addition of some green salad is a nice touch. A well deserved break for Tawn – you both look really relaxed. Sounds like a relaxing place to be. 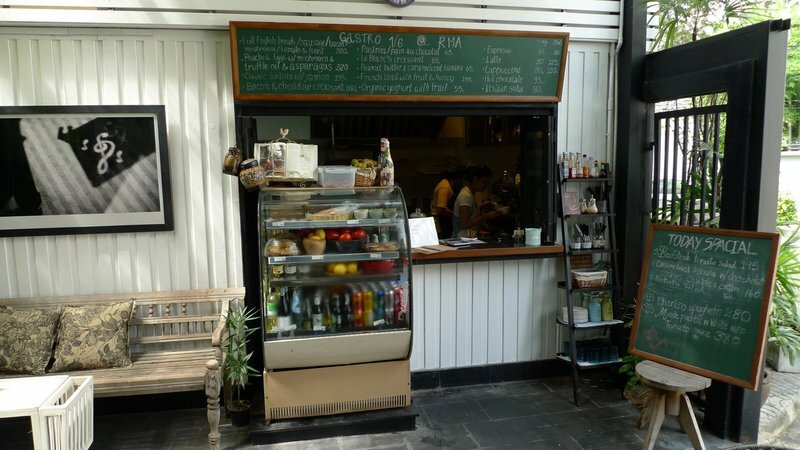 @kunhuo42 – I think a handful of mixed greens lets them charge an extra 30 baht of so! =D@stepaside_loser – @Fatcat723 – @oxyGENE_08 – @windblown85 – @yang1815 – Yeah, it is certainly a “hidden gem”, but I know that it has already been discovered by a lot of the expat and artsy locals set so it will probably get to be too busy over time. The good news is, we seem to be slowly pushing towards a new restaurant segment that focuses on breakfast/brunch, which has been sorely lacking. 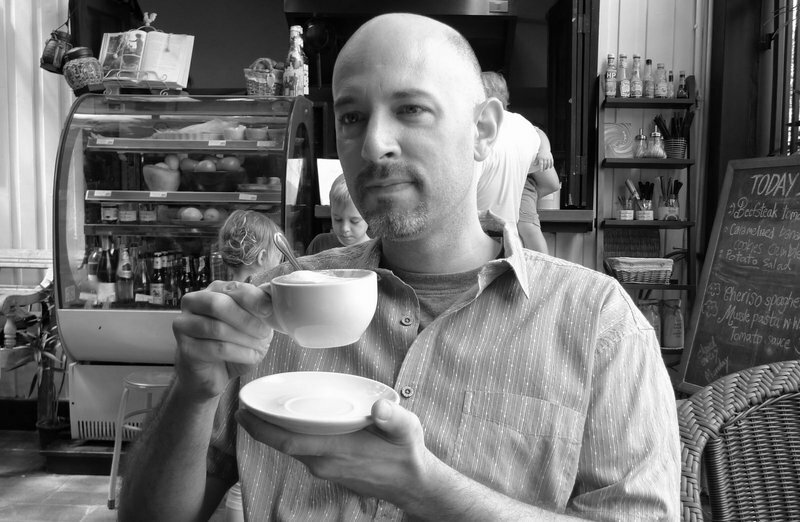 @murisopsis – Seems like everything looks better in B&W except food pics. @The_Eyes_Of_A_Painter – I can fake the accent! =D@ElusiveWords – Tips? He goes around collection adoration instead. @slmret – These type of places remind me so much of California. 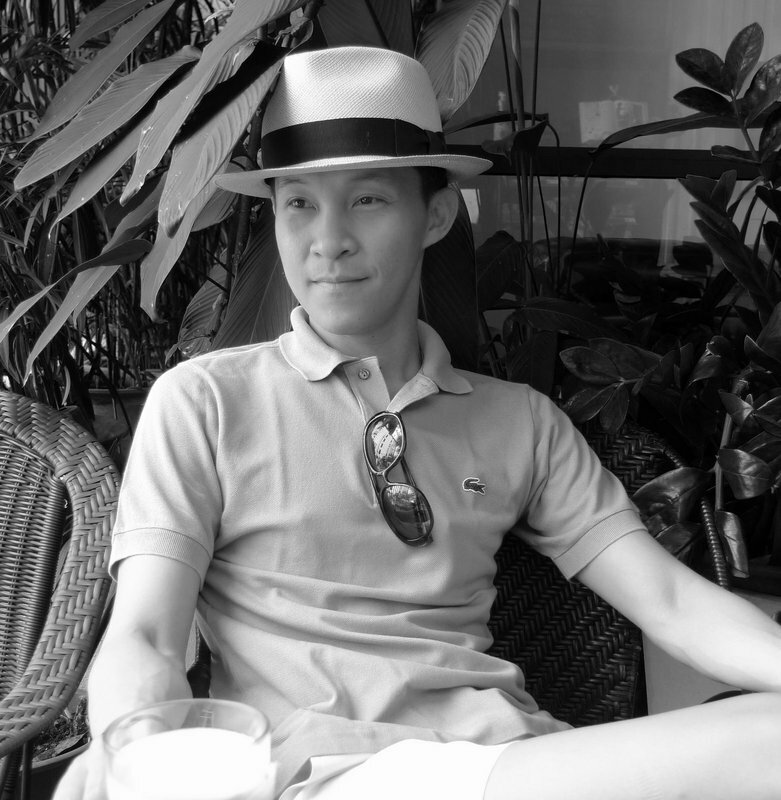 @mocawong – No bugs at all, actually. Don’t know if they spray the heck out of it, or what, but it was just as pleasant a place to sit as could be. 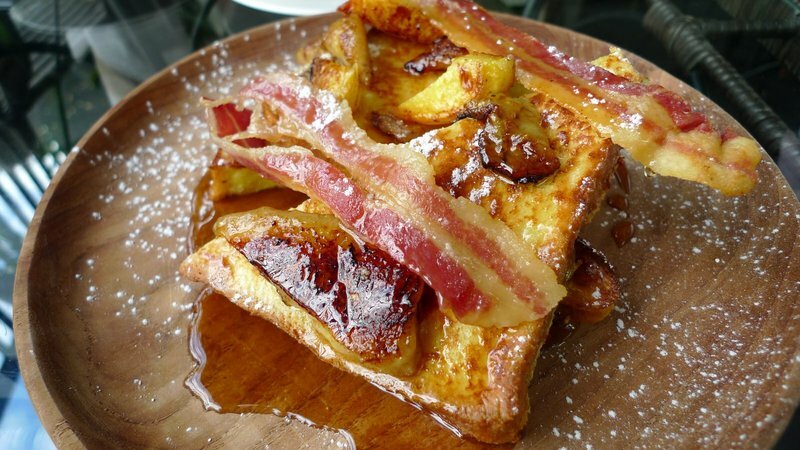 @CurryPuffy – English breakfast was 280 bt, French toast 195, single latte was 90 bt. Compared with Thai street food, it is pricey. Compared with a hotel breakfast, it was comparable to less expensive. Quality and setting were much nicer. We’ll take you and W here, unless a nicer place opens beforehand. @christao408 – This one reminds me of a neat little place in H’wood (2 blocks south of H’wood Blvd, and west of maybe McCadden Pl) — I think it was called Cafe del aAtistes! A nice little patio dining area, or you could eat indoors on a rainy day (when do we ever have those?). @christao408 – Haha~that’s pricey for sure when compared to a typical meal of Thai street food. Looking forward to a food tour with you guys! Love your breakfast plate. Tawn does look so relaxed and so handsome. I will fix you a breakfast like that if you come here for another visit soon. I mean it. @christao408 – Jump on it right now!!! Looks like a nice little restaurant. I’m actually craving what you had in the picture right now… :(And any plans to move back to SF?